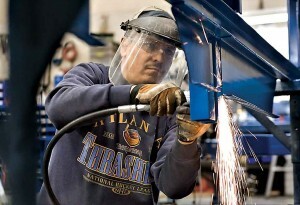 America could be the manufacturing capital of the world for the next 100 years. The old yardstick “lowest unit labor cost” in manufacturing will be swept away. The new yardstick will be “lowest unit energy cost.” America sits on the cheapest energy in the world. There are plants in Germany that have trouble competing with us when natural gas is below $2.50. With policy changes, America could have the lowest unit energy cost and be building and relocating in old factories with new multifunction robots — factories to make these robots. Detroit could rise again. Why? It’s cheaper there. They have empty buildings waiting. We could have a labor shortage. Manufacturing has always chased the lowest unit labor cost. After World War II, cheap toys left the United States and went to Japan. Japan prospered, and toys went to Taiwan, then China, now Vietnam, etc. That’s all about to change. The future will be driven by energy cost. This puts America in the driver’s seat with the cheapest energy, meaning we have the lowest unit energy cost. We have everything we need to be the manufacturing capital of the world, except the policies at the federal level. We have the resources, the world’s best labor force and the money to make it happen. We can do it all with no risk to the taxpayer. Where is all the money to make it happen? Sitting in foreign banks. There are a trillion-plus American dollars overseas. Why? The tax penalty is too great to bring them home. Why don’t we have policies that make American corporations want to bring those dollars home? Remember 2008? Imagine that trillion-plus dollars of liquidity sitting in our banks. There wouldn’t have been a crisis, TARP or taxpayer bailout. What is better for me the taxpayer? The bailout, which costs me and my offspring more than anyone can explain? Lowering or eliminating the tax and a trillion-plus corporate dollars coming into our banks, thus not needing a bailout? Lowering the tax rate will bring those dollars back home. Money will go into U.S. coffers. Some of it will buy bombs, and some of it will be used to study why monkeys clench their teeth. We are not getting anything now. Isn’t a lower percent of something better than 100 percent of nothing? Why should money that wasn’t earned here be taxed here? The current “tax at every opportunity” policy has not led to job growth. With those dollars at home and policy changes, American dollars can now build American factories. Not with taxpayer dollars but with corporate dollars that will take those risks because of the changes we have made. Those changes must include energy, tax and regulatory policies. The competitive world of the future will not reward a defensive player.